You know me, stress, and closets. And trust me, our closets are looking very spiffy these days; January was a crazy month. I was looking through the bedroom closet the other day for Tsia, who wanted some black paper for a project, when I came across my old design portfolio. I honestly hadn't looked at it in ages--at least seven years--and it was fun to reminisce while re-examining it. Included in the book was this project from my last school project: the one that got me my first job. I feel a little weird showing it to you. I mean, it's about ten years old and completely irrelevant to anything at all. But it's an interesting concept for a final project. I'm glad my professors assigned it, and I thought you might enjoy seeing a design-school graduate's portfolio, especially since I had never seen one before I graduated. The concept was relatively simple: we were told to select a target company or designer and then to design a collection for him/her/them. 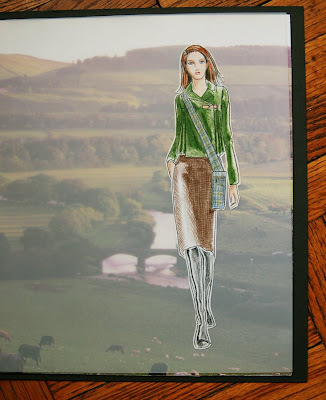 My collection was inspired by two recent trips to Scotland. I love the highlands and traditional Scottish culture: kilts, tartans, Charles Rennie Mackintosh's exquisite architecture and designs, cozy pubs on dark evenings, ageing bed-and-breakfasts, and stopping the car to let sheep to cross the narrow twisty roads as we made our way over the terrain. It all seemed like a great starting point for a fall collection. The first step of the project involved collecting inspiration, swatching fabrics, and developing rough sketches of our initial designs. These designs were then collected into a book that was included in our portfolios to show our design process (meaning how we approached our designs and our thought process in developing the designs). The project required dozens and dozens of sketches and designs. 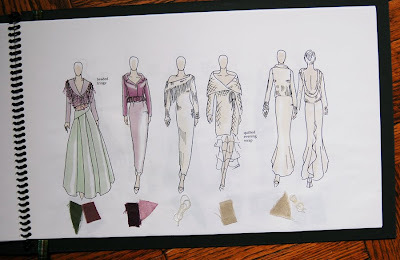 Once I had a stack of sketches, I scanned and colored them in Photoshop to reflect the fabrics I had chosen for my collection. The next step was to select our best designs for the portfolio pages themselves. I'm no illustrator, so I feel a little naked showing these to you. But we drew our best designs in greater detail to reflected our (so-called) drawing abilities, demonstrate our design sophistication (meaning, how our designs reflected the look of our target company), and illustrate our color and fabric choices. And then came my favorite part of the project. We were told to select one element of our collection and highlight it in a separate book that further elaborated on a theme. This was sort of a trend-forecasting project. This project was the most fun because it had the fewest requirements. I work well with restrictions, but I especially enjoyed breaking out and giving this all sorts of attention. The book opens with a brief discussion of kilts and the role they play in fashion. Then each page featured a landscape photo from a Scotland tourist brochure, and within the spread I attached two vellum pages: one of a garment "flat" (literally, a technical illustration of a garment laid flat, like we show on the back of the Oliver + S pattern envelopes so you can get a better idea of the details of each piece) and an illustration of someone wearing the outfit, theoretically walking a runway. I had so much fun pulling together the various elements of this book. And guess what? I got the job. These are great--thanks for sharing! It's so interesting to see a little of the inspiration behind things. And your illustrations are lovely! How neat! Thanks for sharing-- I love the scottish theme. 10 years old or not, I'd love to have that blue coat! For real! I concur...I really, really love that blue coat. The green jacket is fabulous too. Thanks for sharing. From one Design School grad to another, your illustrations and presentation are mint! The illustrations from this project are so beautiful - thank you for sharing them. The designs and colors are gorgeous, and I love the effect of using the landscape background too. Your project is fabulous. 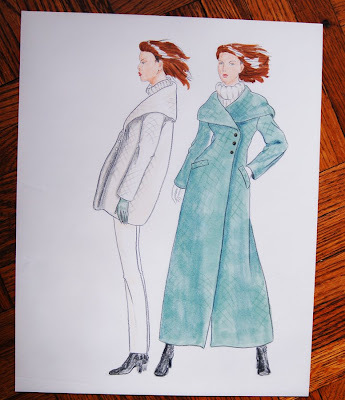 I love both the blue and brown floor length coats! And as I totally love Scotland, I thought your theme was fantastic. Thank you so much for charing your sketch book - it's fantastic. Wow, this is so cool to browse through! 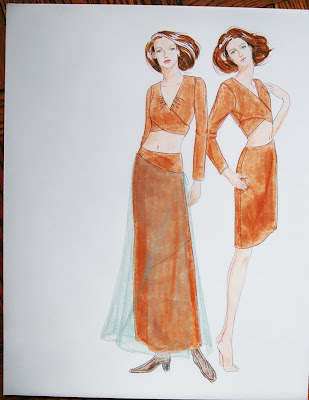 I'd love to do a project like this, even though I'm not enrolled in a fashion course. 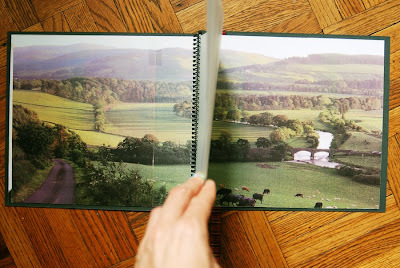 I love how you used the velum pages overlaid on the landscapes. You've got me thinking about what I would pick as my own element to elaborate on ... thanks for the inspiration! I want the jacket/sweater with the really wide collar. Fun!